She: You are a pessimist! He: I am a realist. She: Is it helping you live life? He: I am living with no contemplation. He: Till the emptiness doesn't engulf me. He: (laughing out loud) Now, you are talking about destiny who curses it every time we met at crossroads. She: Why aren't you ready for the new phase? He: I am not. (leaves out a sigh) I am not. He grips her hand admiringly. She: I can see the past with its dark hands creeping your thoughts and slowly ruling over them. Leave it. Forget the people in it. You do not live there anymore, not anymore. I can call you that my beloved Ganesha. I know, I know, you aren't a 'person' which this letter is meant to but then you are well aware of my perspective of 'God'. I share a love-hate relationship with you that I do not with anyone. I love to talk with you even though knowing you won't answer them. But I find solace just looking at you. Well, hate is a strong word but then opposite of love is hate, ain't it? For years I have stayed aloof from you. It doesn't mean I have forgotten you. I find your glimpse in each day of my life - in a person, or circumstances. Have I said - 'Thank you' to you? I guess, not enough with what you have blessed me with. I had burdened you with many wishes, not anymore. Thank you for making me realize how beautiful this life is which most often I had lost in grieving over what I never had rather than being grateful with what I have! I am still amazed with the story you have written for me. I do not want to turn the pages beforehand of this book of my life. I will live in it, one day at a time. Okay, I know you are waiting for the reason why I am writing to you today. I wouldn't have written this letter to you anytime before. 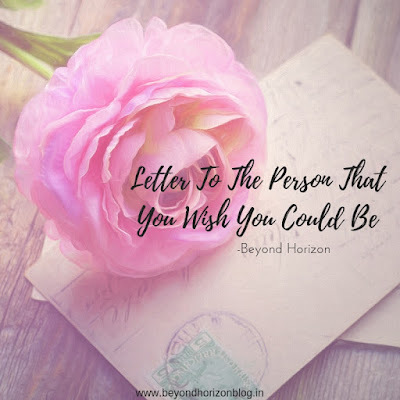 The recipient of this letter was Anne Frank whose words adorn the tagline of my blog. 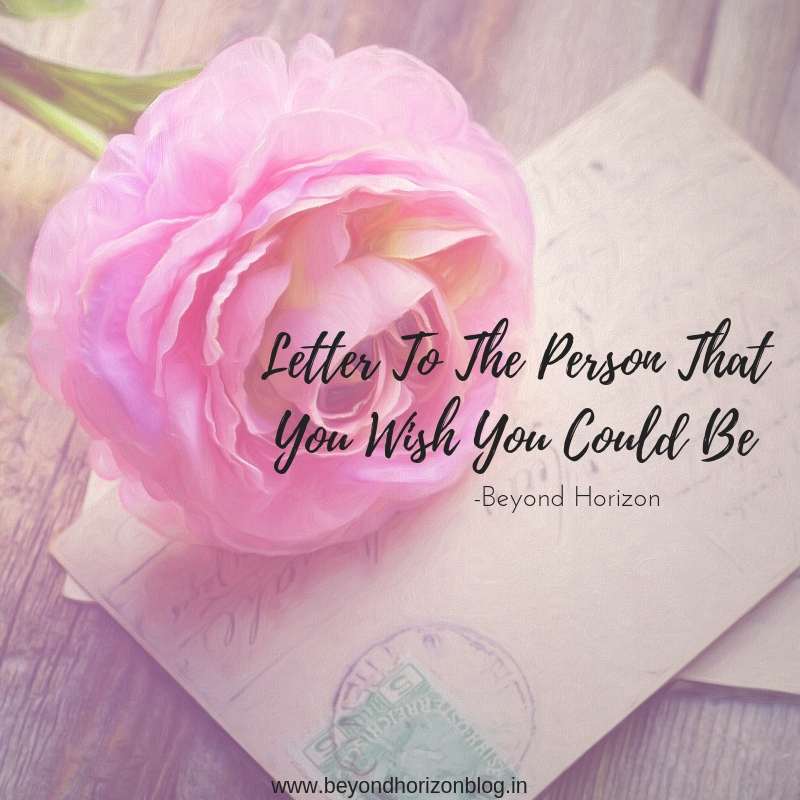 Do you know why I want to write to you - the person that I wish I could be? Because you have all the wonderful people I had in my life once. No, I am not angry with you. I just want you to convey love to my angel baby and I shall meet her, soon. Take care. 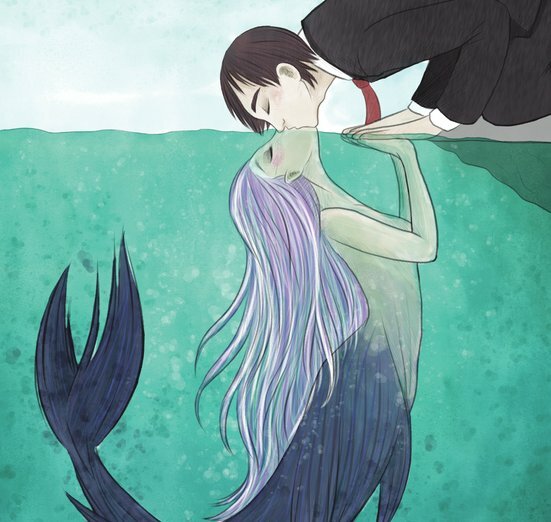 What is the 'right' age to fall in love? Will you fall in love once again after loss, conflicts, betrayal or heartbreak? 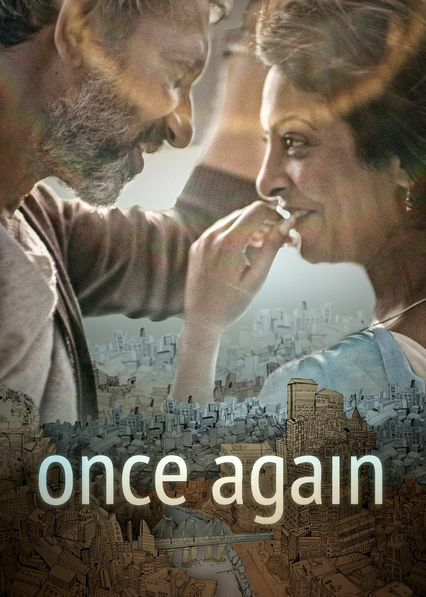 Once Again starring Shefali Shah and Neeraj Kabi is a story of two middle-aged people exploring love and trying to find companionship, as the title suggests - Once Again! Tara Shetty is a single mother and a restaurateur. Having lost her husband at a young age she lives an independent life and looks after her son and daughter. Amar is a theatre veteran, extremely meticulous and is amidst a struggling relationship. The movie begins with their telephonic conversation with the scenes of everyday life in Mumbai. They have known each other as Tara sends meal box to him but never met. The only connection till now are the phone calls at the end of the day. She isn't star struck with his big personality and begins watching his films only after the conversations. 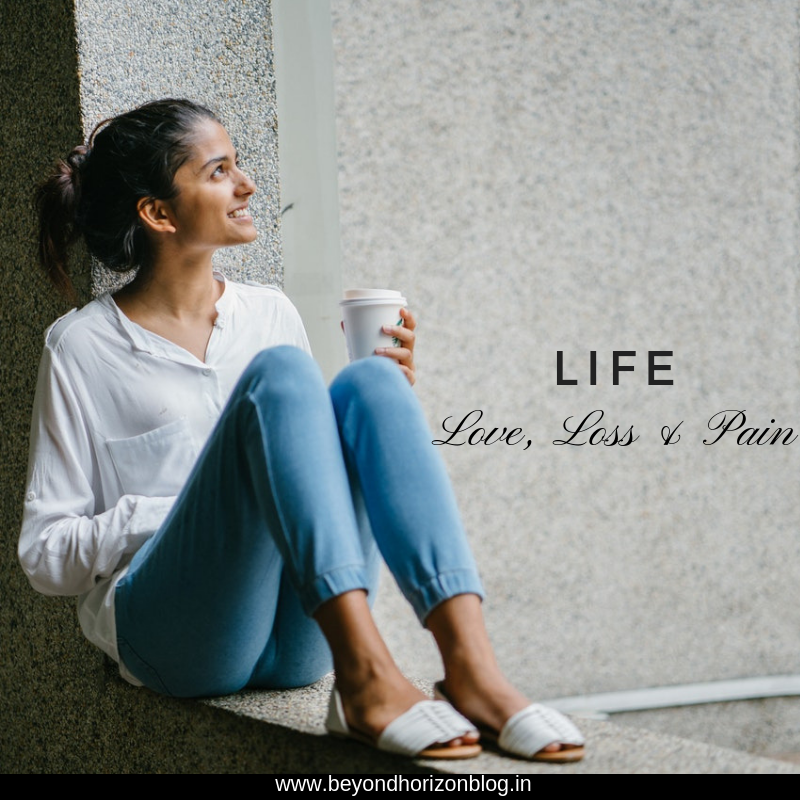 Tara sees a lost man who is struggling with his personal and professional life and for Amar she is a straightforward individual. They find solace in each other's words and yearn for something. Is it love? Sometimes the scenes become more alive not with the dialogues but the intimacy between the two protagonists. Shefali Shah is an exceptional actor. Lookout for the loneliness her character portrays. You can see the grief and longing for someone after years of living life only for her kids. Neeraj Kabi has given the justice to the role of a father who despite his broken marriage strives to build a healthy relationship with daughter played by Rasika Dugal. The direction of Kanwal Seth is worth watching that captures the face of common man walking along the street, lashing waves at Marine drive, the sound of grinding of spices in traditional manner, the splash of water on the hot pan for dosa, onions being fried. They grab your attention to the minutest of detail. The background score is enough to keep you watching in the first hour of the movie. It brings alive the characters of two lonely souls who find comfort and ease in each other’s presence. How can the world be not against the two souls (one widow, other famous and divorcee) who have yet to find love but only their being together in public is like a stick in the eye! When they get “caught” in public and the news get published, Tara’s son who is about to get married doesn’t support her. While her daughter understands the loneliness of her mother. Tara fights within, the emotions and responsibilities brings on turmoil. 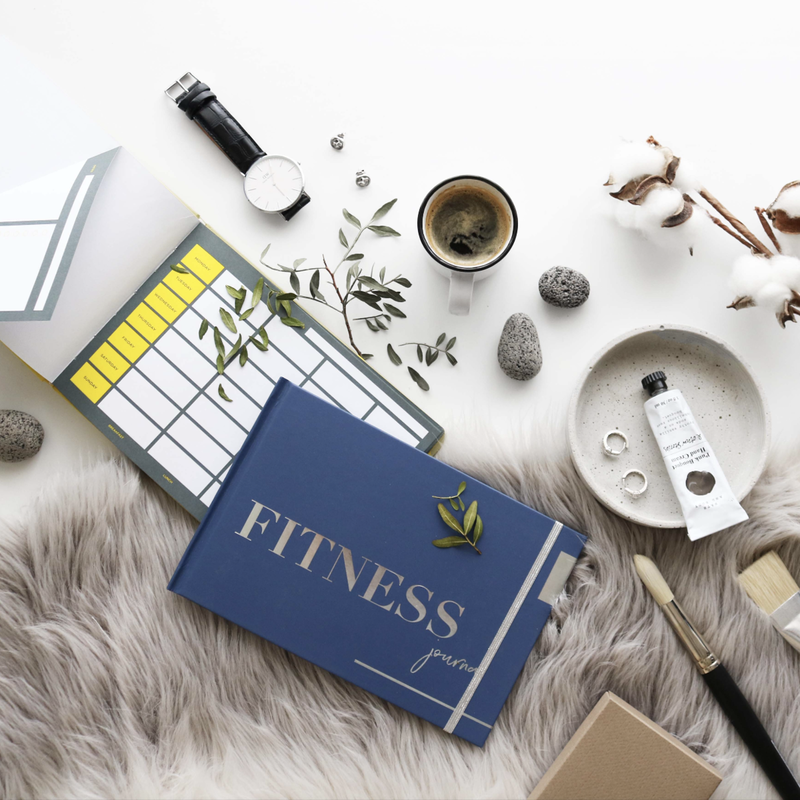 Amidst the obligations of being a wife, upbringing of children and running a business, she has shoved away her life and lived a life of self-denial. What will she do? She has lived 20 years of life without a companion. Does she give up her blossoming relation with Amar for her children’s sake? Why should you watch Once Again? 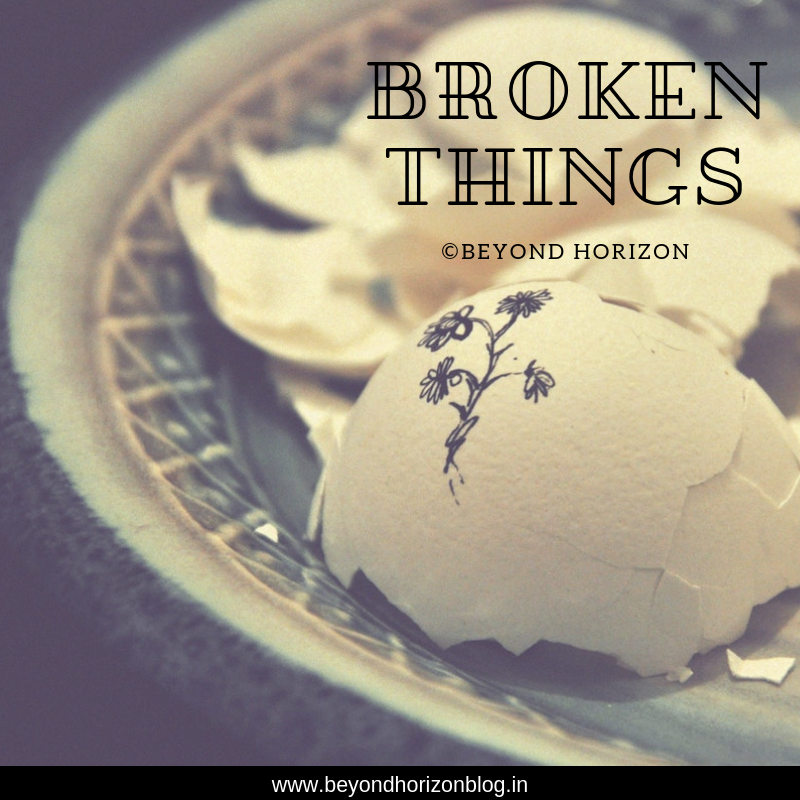 For the subtle, mature romance between Tara and Amar: their first meet, the long drive, sitting atop a hill, mesmerizing time at Marine drive, their conflicts and the intimacy. Why you can skip watching Once Again? You may get bored, because the story is stretched which makes it boring at a certain point. It would have been a perfect short film if wrapped up on time. Nevertheless, it is a movie with an attempt to break the stigma attached to middle-aged single men or women to be in an intimate relationship. How can I forget the touch? How can I forget the kiss? "Why do you keep them?" What I have left with." I have lost something / someone. You must have too. No one is spared from it. What did you do after the loss? Can you share it? We do not stop loving a flower even after knowing it is not here forever. What is forever? Nothing lasts forever. Not the flower. Not the people. Not even the loss. What if two people loving each other can’t live together? Isn’t it love? This love does lasts forever. Love doesn’t bring insecurities. Love doesn’t bring fear. Love gives courage to live on. I am blessed to be loved. I had and have tough times. We all have. If you know me quite well, I am not the one to deter with the ongoing storm. Yes, I do have fears but I will never let those win over me. The day the fears win, it would be my death. What I am today is because of ‘my decisions’. I have (nearly) given up the belief of ‘destiny’. The retrospective vision has toughened my thinking about what I wanted and what I have lost are due to my decisions. My happiness. My sadness. My madness. My craziness. My gain. My loss. All that I have earned is because of me. No one is to be blamed for. 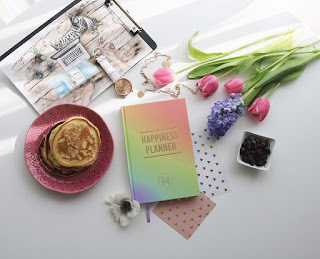 I am happy because I want to be. I smile because I want to. I cry (not much) because I want to. My words cry. I can make the words laugh. I can make the words hurt. 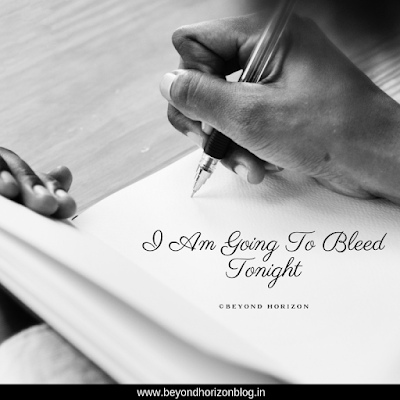 I can bleed through words. Like the tiny happy showers of rain to the deluge that creates loss, my emotions are powerful enough to break me. Like a lifeless landscape, I go numb to the threshold where I can’t feel anything. I do feel the pain. I don’t let it evoke any emotion. You won’t see it in my eyes. You won’t find it in my words. I don’t need alcohol to drown my sadness. I don’t need any addiction to forget the pain. I am master in masking the pain. It ain’t an achievement at all! I drop my mask only when I look myself in the mirror. It doesn’t lie. It never fails to capture my pain. I can’t feign to be the one ‘I am not’ in the reflection. If you ask ‘why’? I will answer – ‘I don’t know’. If you do not understand me, I won’t pursue you to. This is who I am. Why did I pick her book when there are acclaimed memoir? I was impressed with the story of Soha Ali Khan and her mother Sharmila Tagore published in HT Brunch. I could see two beautiful ladies living a simple life, nurturing values from mother to a daughter and then daughter to her daughter. It intrigued me. 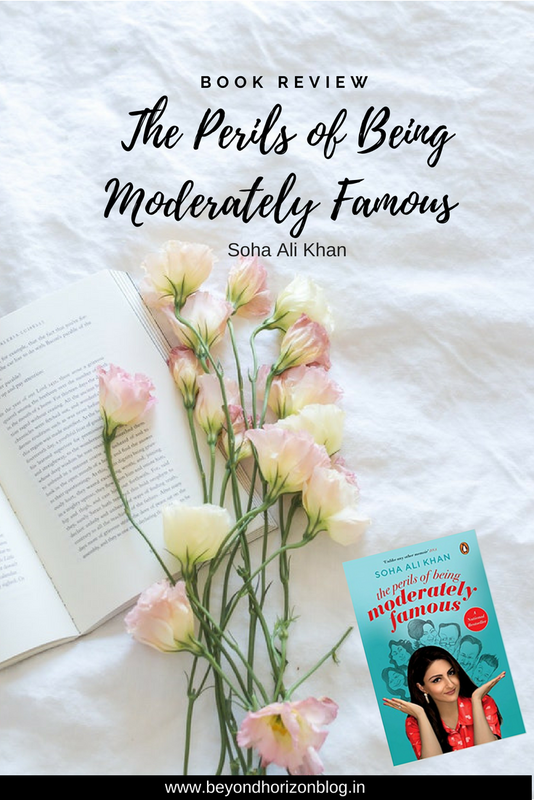 The moment I started reading The Perils of Being Moderately Famous from the Introduction it felt like the author is sitting right across me and narrating her story. 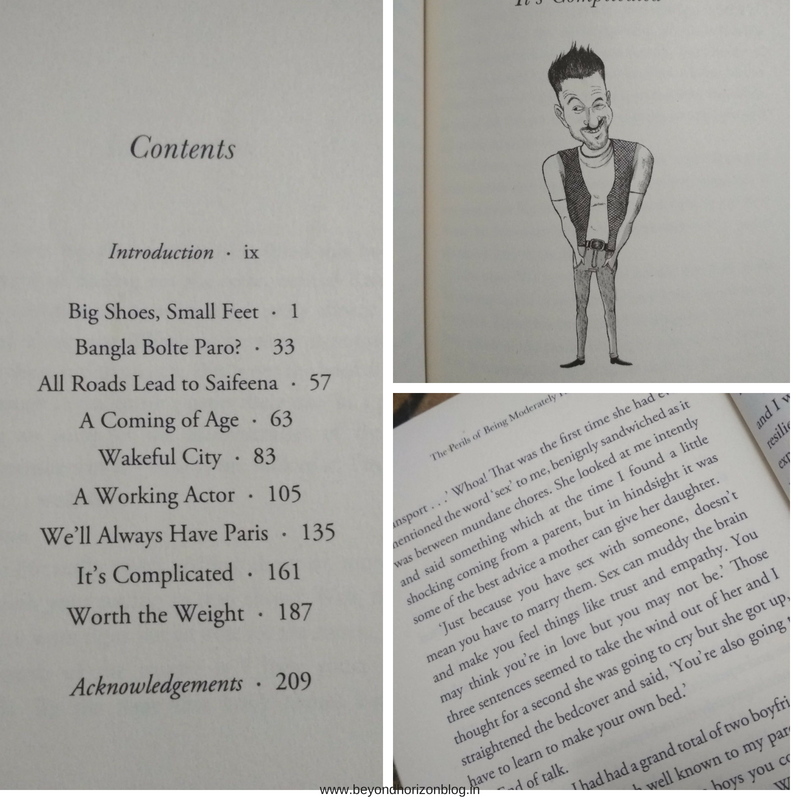 The book begins with a witty note followed by the history of the royals – the Nawabs of Pataudi, life of her father – Mansur Ali Khan Pataudi. She has divided the book in 9 chapters and the titles are quite interesting.One may not like the first two chapters wherein she has explained in-detail about her ancestors but it is her family’s history after all. The book paces up with the third chapter. The sprinkle of humor here and there made me to read on swiftly. 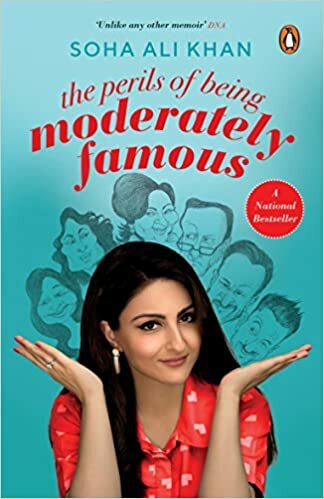 Soha Ali Khan writes about her life growing amidst famous and how she built up her own identity. She writes affectionately about the relationship with her father. How many of us knew she is an Oxford graduate and later on worked in Citibank as a Manager in Mumbai till we read this memoir? She is extremely well-read and this has helped immensely in her flawless and candid writing style. We’ll Always Have Paris is about her travel experiences with her pal – traveling across the Sahara Desert, standing along the Grand Canyon, spending night in clay hut and finally coming face to face with one of the wonders of the world – Eiffel Tower and wishing to find her love beneath it. Indeed, she did later on after many years. 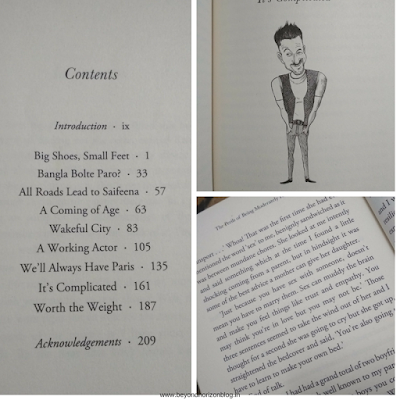 How can I not mention about the chapter – Wakeful City, after all its about her love for Mumbai (mine too). My most favourite are the last two chapters where you will read how she fell for Kunal even though younger than her. It is adorable, funny and intelligently written and ends with a note to the reader. The last one is about her pregnancy. Soha Ali Khan has dedicated this memoir to her daughter, Inaaya and ends with a note to her. Don’t read the book for her being related to famous people in her life, not for Saifeena but read it for Soha Ali Khan – you’ll find an outstanding writer and become a fan of her writing. Watching romedy movies are my guilty pleasure! So when Netflix picked movies for me, Coffee Shop being among them I couldn't resist after reading its synopsis. Coffee Shop is all about love; lost and found. The same forgotten love? Let the movie unveil it. It is the story of Donavan Turner, independent woman in her 20s who spreads love through her coffee. Young and smart she owns a coffee shop in a scenic beach town. The peculiarity of visiting her shop: she has a perfect coffee choice matching people’s personality. Now who wouldn't love that! While Donavan is sweet, her sister, Becky is extrovert and doesn't hesitate to put her heart out. The sisterhood in the movie is a pleasure to watch. Becky and her boyfriend Kevin are both meddling characters who are striving to help Donavan in the romance department. But their choices differ and results into some entertaining scenes. Donovan has a robust support from her co-workers Eli and Sarah (you'll always smile when they are in the scenes), regular coffee customers. When Frank Miller, the newly appointed bank owner refuses to extend her loan she is on the verge of losing yet another important thing in her life she yearned. Who said life would get easy for Donovan? It gets intricate when Patrick (ex-boyfriend) sweeps back and announces his love for her (once again!) and offers to help her with the financial ruin. Are you an ardent coffee lover? Then you would be familiar with the clashes with a tea-drinker and a coffee lover. So when Ben Carson comes from Broadway to rejuvenate his play writing skill and orders tea in a coffee shop, you must see the look of Donovan. The movie gets more interesting with their interactions. Donovan cannot lose her coffee shop – her identity. The memories of her mother and her words are Donovan’s strength. She talks about her during a charity concert and sings a song that will not fail to warm your eyes. Watch out for the interaction between one of the loyal customer and Donovan who hands a letter from her mother. Highlight scene in the movie: Donovan waits for Patrick on their date (who is late) and Ben comes across her. Oh and she does look elegant! The sparks between them will make you talk inside your head – This is it, her love, dance with him, ditch Patrick. Will she? Does she break down and lose everything she owns – coffee shop and love? The suspense level will make you watch the movie till the end. 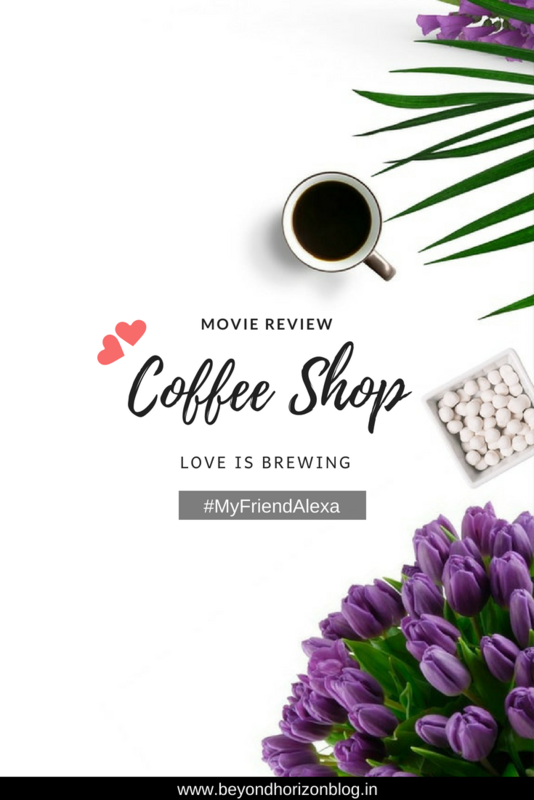 Coffee Shop is a sweet romantic movie, well-plotted with amazing portrayal of characters. A perfect for the weekend filled with warmth and love. Have you seen Coffee Shop? What did you think?